Many plants are hardy for some drop in temperatures, but when frost threatens, it is smart to take steps to protect delicate plants. By protecting plants from frost damage, gardeners avoid the frustration of losing whole plants and needing to redo a landscape that has been ravaged by a cold spell. When temperatures drop low enough to form frost, the ice that accumulates on the leaves and foliage of delicate plants will chill the plants, freezing the fluids within the plant's cells. When those fluids freeze, they expand and rupture the cell membranes, killing the cells. These leaves will turn brown or black and soften, and they cannot recover. After a heavy frost, a delicate plant may be completely dead, or it may die back to the ground and it could take a long time to recover its previous growth. 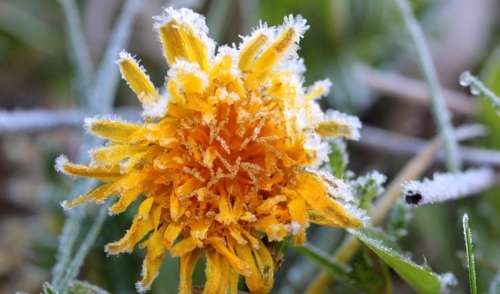 There are several tactics that can help protect plants from frost. Using several techniques is the best approach and will provide the most thorough protection for frost-sensitive plants. Covers: Covering plants is the most familiar method of frost protection, and one of the most effective. Covers should be breathable such as bed sheets, blankets, drop cloths or burlap sacks, and the covers should be staked or weighted to the ground so there are no gaps. Heat from the ground will be contained under the cover and keep the plant warmer, minimizing frost, but stakes or spacers should be used to be sure the cover does not crush the plant's foliage. Covers should be removed in the morning as the temperature warms so plants can breathe and recover. Mulch: A thick layer of dark-colored mulch can help keep warmth in the soil, and the dark coloration improves the mulch's ability to absorb solar radiation, which it will then release back around the plant as the temperature cools at night. Wood chips, bark, straw, pine needles and fallen leaves can be used as winter mulch to help minimize frost damage. For the best effectiveness, mulch layers should be at least 2-3 inches thick. For low, mounding plants that go dormant in winter, mulch can be applied over the entire plant, but should be removed before spring growth begins. Clustering: Container plants should be clustered together to help survive a cold snap and reduce the risk of damaging frost. The humidity released from plants' leaves will help keep them frost-free, and the more plants that are clustered together, the better their chances of survival. If a hard frost is predicted, container plants should be moved into a sheltered area or inside a garage or shed if possible, and a blanket can be wrapped around the pots or the entire group of plants can be covered for extra protection. Watering: Damp soil holds heat better and well-watered plants are more resilient to cold damage. Begin gentle watering 2-3 days before the frost is predicted in order to help plants absorb as much water as possible, but do not water them if a complete freeze is predicted, since wet soil is more likely to heave during a freeze, which would damage roots. Succulents should also not be watered before a frost or freeze, as they hold much more water naturally. Heat Lamps: In extreme cases, heat lamps can help protect plants from frost. A 100-watt bulb can be used to keep plants warm, especially if it is placed under a cover to protect a plant cluster or larger plants such as saplings. Be sure the lamp does not touch the plants, however, or it could cause burns. If a single bulb is not available, non-LED light strings can also be used to raise the ambient temperature around a plant and protect it from frost. Protective Placement: When planning a landscape that may be subject to frost, it can help to place delicate plants in sheltered locations. Positioning frost-sensitive plants alongside a rock or block wall that will absorb heat is useful, and the plants can be arranged in raised beds where the coldest air will sink to lower places. Areas that get good afternoon sunlight can help plants keep warm, and a fence or wall can help block northern winds that will exacerbate frost conditions. Hardy Plants: Choosing hardy plants for the landscape can be the best frost protection of all. Opt for plants that are well suited for your climate zone, and choose native varieties that are adapted to local conditions whenever possible. Be sure the plants are healthy before planting, and they will be better able to resist any local temperature extremes. It can be nerve-wracking when frost threatens delicate plants, but by taking appropriate steps, it is possible to minimize the risk of damage and keep plants protected as the temperature drops.